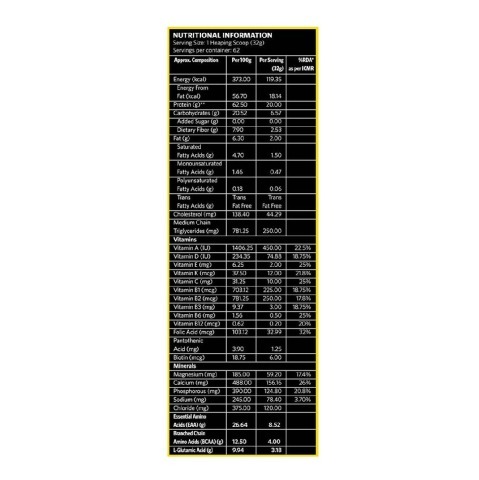 Online Lab report from accredited lab with every product. MuscleBlaze Whey Energy with DigeZyme 4.4 lb Chocolate helps to perfectly meet the increased protein and energy needs of gym beginners and athletes. 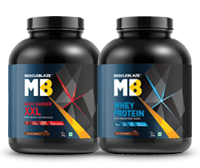 Each serving provides 20g premium Whey Protein Concentrate, Whey Protein Isolate and multivitamins to the fitness enthusiasts. 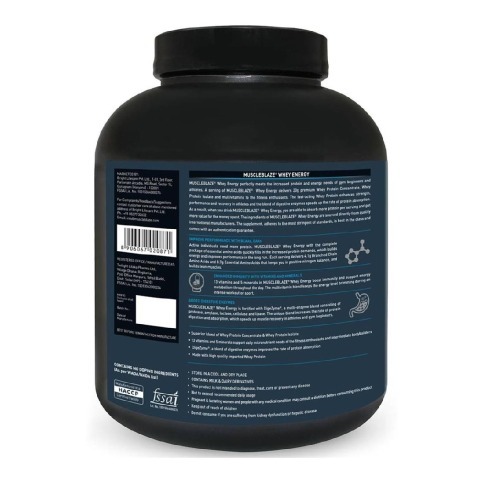 The fast-acting Whey Protein helps to enhance strength, performance and recovery in athletes and the blend of digestive enzymes speeds up the rate of protein absorption. As a result, you are able to absorb more protein per serving and get more value for the money spent. 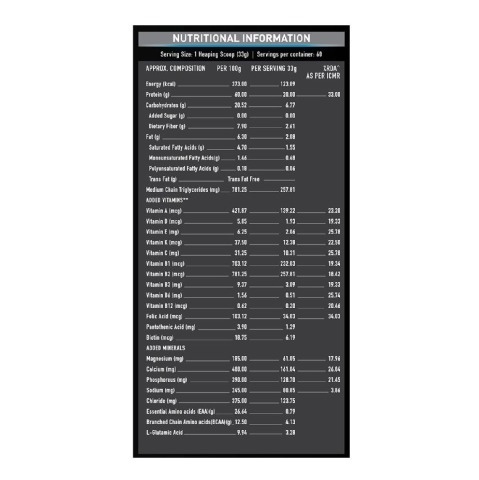 MuscleBlaze Whey Energy 4.4 lb Chocolate is a source of complete proteins and aids fill in the increased protein demands of gym beginners and athletes. 13 vitamins and 5 minerals in MuscleBlaze Whey Energy boost immunity and support energy metabolism throughout the day. The multivitamin blend keeps the energy level brimming during a rigorous workout or sport. The unique blend of digestive enzymes in MuscleBlaze Whey Energy Chocolate aids to increase the rate of protein digestion and absorption that fastens muscle recovery in athletes and gym beginners. 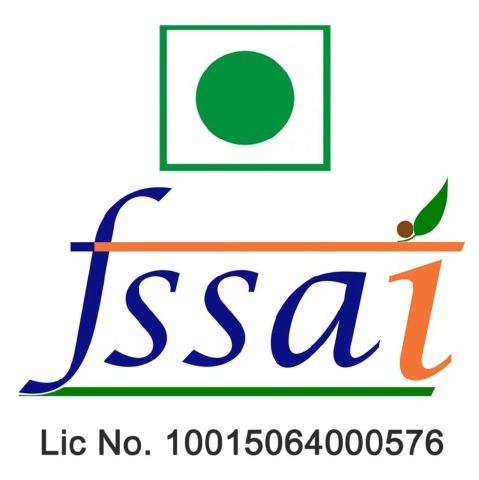 Whey Protein Concentrate, Polydextrose, Cocoa Powder, Whey Protein Isolate, Medium Chain Glyceride Powder, Tricalcium Phosphate, Stabilizer (INS 415), Trimagnesium Phosphate, Sodium Chloride, Digezyme, Vitamins. 1.Who should have MuscleBlaze Whey Energy? If you are a sportsperson, train for marathons or have started bodybuilding, your protein needs will be more than a normal person. You will also feel short on energy at times. 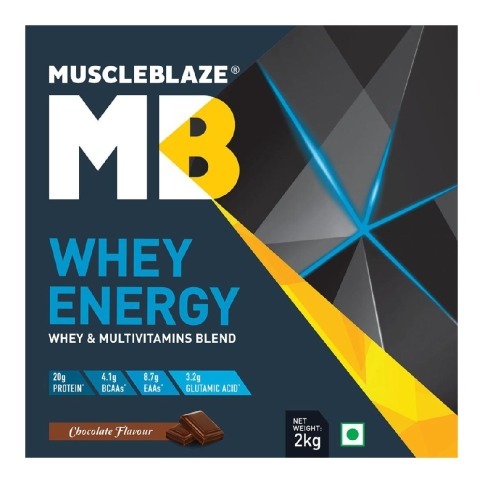 MuscleBlaze Whey Energy provides 20g high-quality proteins, multivitamins and digestive enzymes in a serving to fulfill your increased protein and energy needs. 2.What are the benefits of MuscleBlaze Whey Energy? MuscleBlaze Whey Energy is a premium protein blend of whey protein concentrate and whey protein isolate. 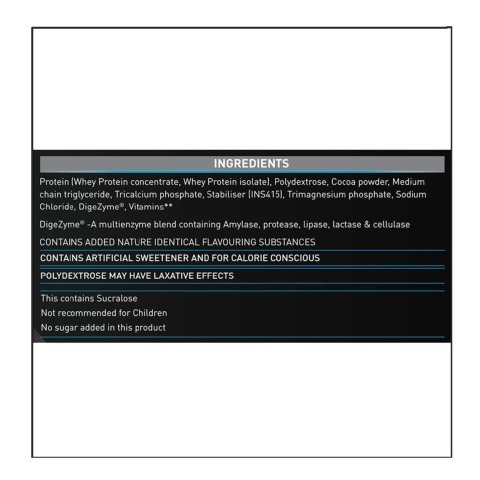 It has 13 vitamins and 5 minerals along with digestive enzymes. Together, all these ingredients fulfill increased protein needs and build energy in active individuals. 3.How DigeZyme® improves protein absorption in MuscleBlaze Whey Energy? MuscleBlaze Whey Energy is fortified with DigeZyme ®, a multi-enzyme blend consisting of protease, amylase, lactase, cellulase and lipase. The unique blend increases the rate of protein digestion and absorption, which speeds up muscle recovery in athletes and gym beginners. 4.Why multivitamins are added in MuscleBlaze Whey Energy? Vitamins and minerals, particularly B-complex vitamins and vitamin C are critical for boosting immunity and energy. Moreover, the multivitamin blend effectively meets dietary shortage, if any. 5.How is MuscleBlaze Whey Energy different from other whey formulations? The unique formulation of MuscleBlaze Whey Energy is an all-rounder protein for fitness and muscle building enthusiasts. 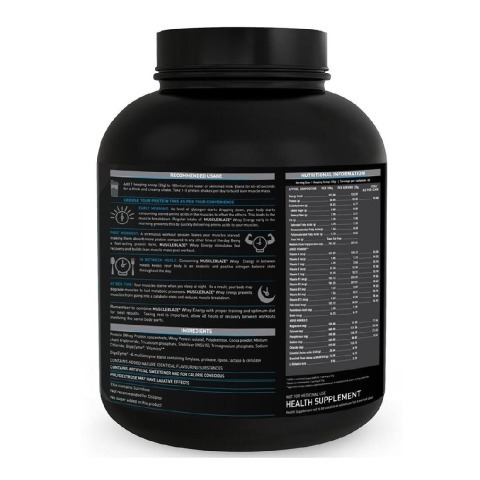 The mix of whey protein concentrate and whey protein isolate immediately supplies critical amino acids to muscle tissues post workout and enables quick recovery. All the essential vitamins and minerals are present in MuscleBlaze Whey Energy to support the body’s energy metabolism and maximise energy level for rigorous workouts. The presence of digestive enzymes speeds up the rate of absorption of nutrients in MuscleBlaze Whey Energy. 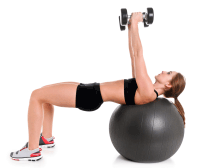 6.I am a beginner/casual gym goer, can I use it? MuscleBlaze Whey Energy is just the right whey protein for fitness beginners/ casual gym goers. The protein blend with multivitamins boosts muscle recovery after a workout. 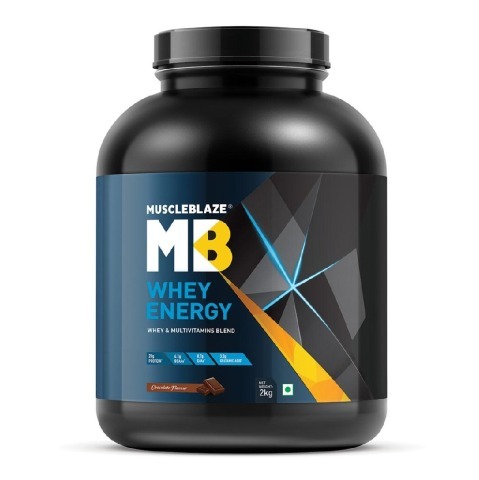 7.I am not a bodybuilder but play sports, will MuscleBlaze Whey Energy help me improve my performance? Whether you play sports or are a bodybuilding beginner, an overdose of physical activity causes distress to your muscle tissues, which makes a whey protein shake critical after a workout to trigger the new muscle synthesis. MuscleBlaze Whey Energy with its blend of multivitamins gives more power to your performance. Drink it in the morning and in-between meals to preserve your lean muscle mass. 8.How should I take MuscleBlaze Whey Energy? You should mix a heaping scoop (32g) of MuscleBlaze Whey Energy in 180ml of cold water or skimmed milk. Blend it for 45 to 60 seconds to get a thick and creamy shake. You can drink in the morning, after a workout, in-between meals or at the bedtime. Drinking MuscleBlaze Whey Energy after a workout helps in quick recovery and builds lean muscles.